Hubby and I went to Raraya to celebrate the start of summer vacation! Every day is a vacation for me but for my hardworking hubby it’s well deserved. We shared 6 pieces of Gyoza ($4.00) which was a little burnt but still good. His Charsu Ramen ($10.00) with shoyu tonkotsu broth and thin noodles. 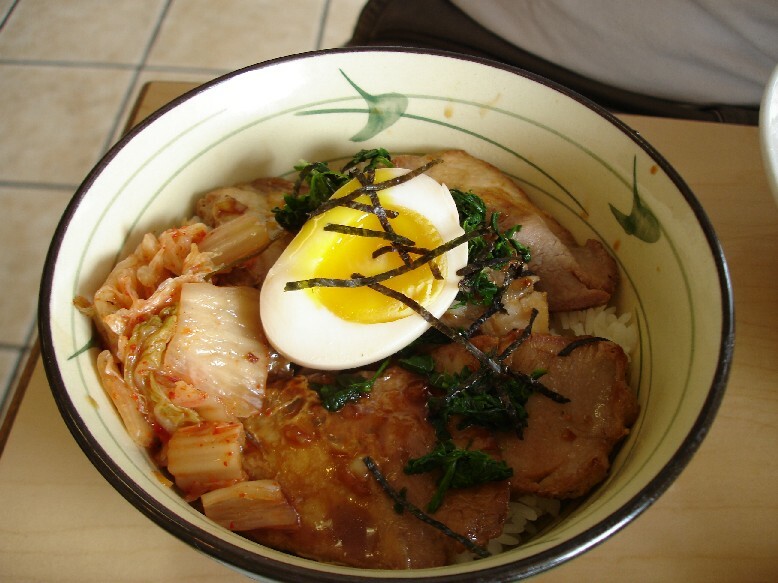 He also added on a Mini Charsu Bowl ($4.00). Does he like charsu or what? I was in the mood for something lighter so I tried their chicken based broth for the first time. 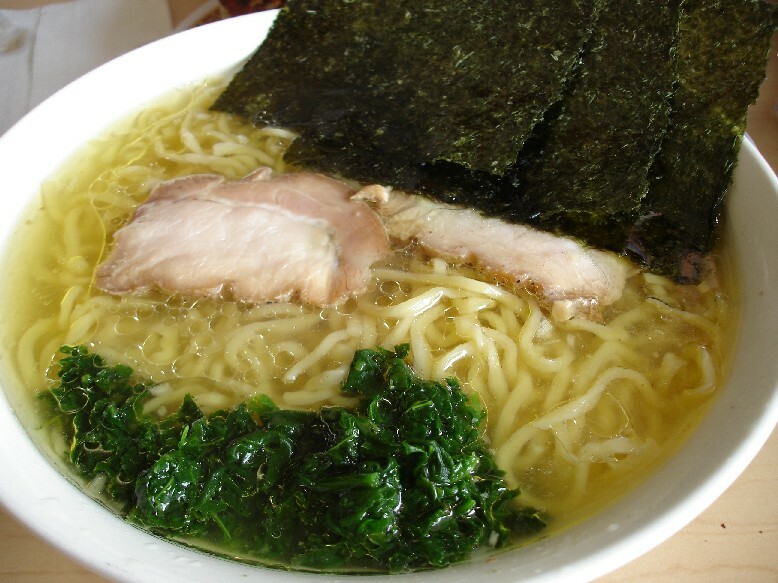 Torigara Ramen ($8.00) with shio (salt) instead of shoyu. The broth is clear and appears to be assari (light) in flavor, but in actuality it had lots of oil floating on top and was quite satisfying. It was like a really really good bowl of chicken noodle soup. I still wish they offered a thinner noodle option but I’d still come here again and again just for the delicious soup. View a previous post on the restaurant here and view their menu on my original post here. 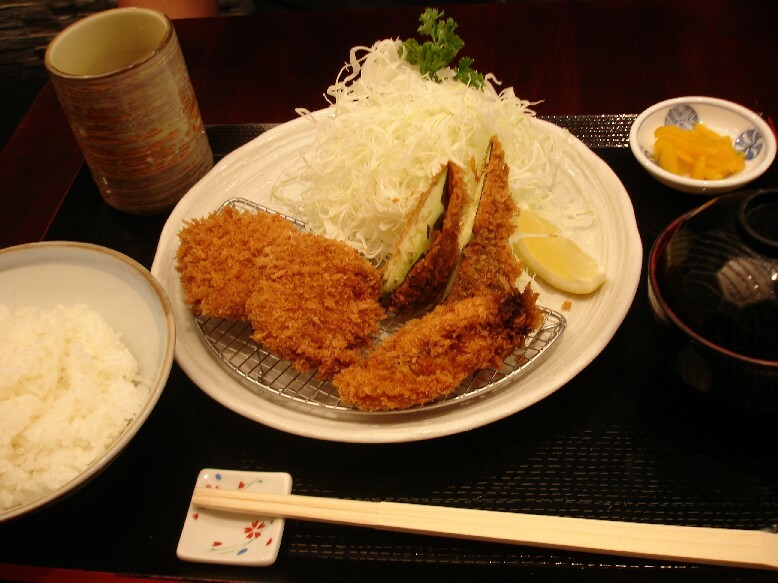 I went into Waikiki for lunch with some friends/former co-workers at Tonkatsu Ginza Bairin. I forgot to mention that I am currently eliminating meat from my diet. I just thought I’d try it to see if it has any positive effects on my health. I eat a mostly vegetarian diet but still eat dairy, eggs, and seafood on occasion. It’s a good thing because other than pork, pork, and more pork, the only alternatives here are chicken karaage and shrimp katsu. 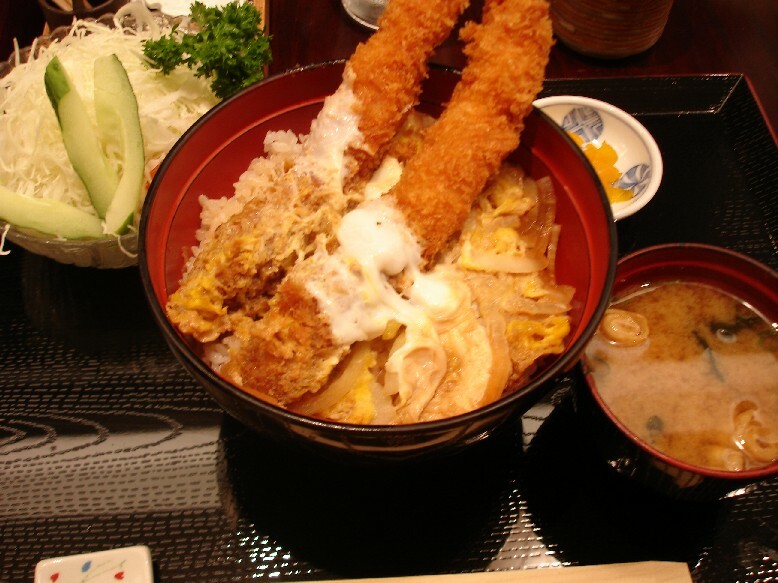 I ordered the Jumbo Black Tiger Shrip Katsu-Don ($16.00) which had 2 unbelievably huge pieces of shrimp. It’s almost like they glued together the body of three shrimp to make one long shrimp. You have to see it to appreciate it. 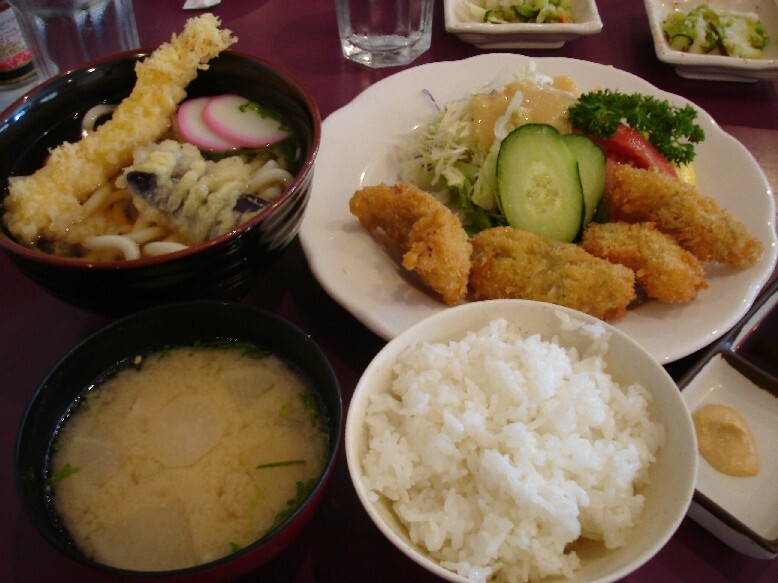 And her boyfriend had the Higawari Lunch Special ($13.00), which was always my favorite for its great value. Higawari means “changes everyday” and this day’s special consisted of fried eggplant, 1 piece oyster, and 2 pieces pork tenderloin. Everything was delicious. 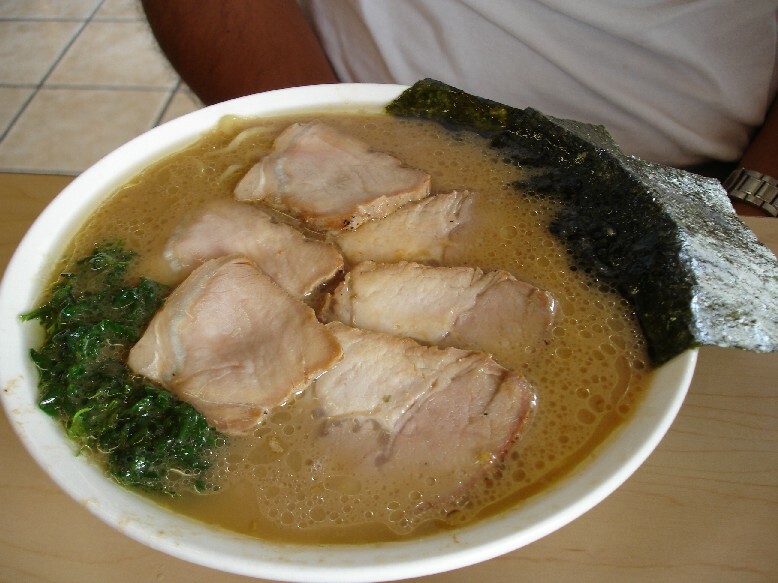 Ginza Bairin is one of the few places in Hawaii where I could actually believe I’m sitting in a restaurant in Japan. I can’t quite put my finger on it but it’s a combination of the fresh flavor, presentation, just-right portion size, service, and even the delicate way they cut their vegetables. You can view a previous post on the restaurant here, and view the menu on my original post here. I met up with a friend for dinner at Sansei. I hadn’t seen her since her wedding in March, so we had lots of fun rehashing the moments of her special day and thumbing through the proofs of her professional wedding photos. The last time I went to Sansei was when they were still located at Restaurant Row, so that goes to show just how long it’s been. They’re now located inside the Waikiki Beach Marriott on the 3rd floor and share an entrance with D.K. Steakhouse. Their menu features a lot of specialty sushi rolls that mix the flavors of east and west as well as more traditional nigiri and maki sushi selections. 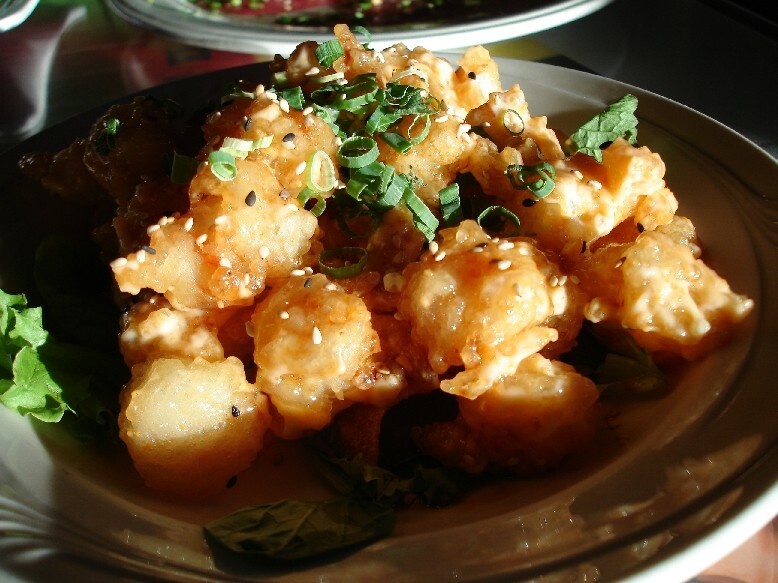 My friend ordered the Shrimp Dynamite ($11.95), one of her favorite appetizers here. It was light, tasty, and the portion size was generous. 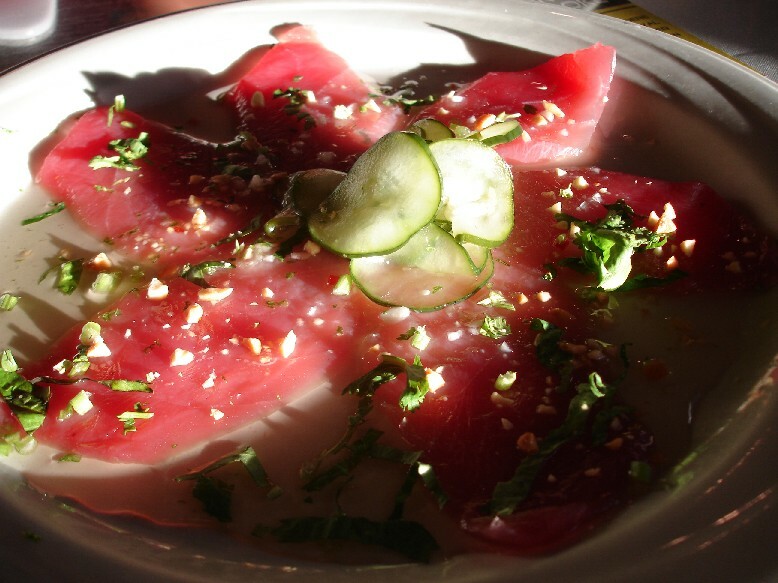 I tried the Ahi Carpaccio ($11.95). I love carpaccios of any kind and cannot pass it up if I see it on a menu but I was disappointed by Sansei’s version. It was just thin sashimi swimming in a watery vinegar (Thai Vinaigrette) and garnished with peanuts and cilantro, but I think it should have been less sweet and with a little bit of oil to enhance the texture of the fish. Here’s the White Diamond Roll ($18.00) which was one of their specials. It had so much going on including spicy tuna, kabayaki sauce, pickled ginger, onions, etc. but it tasted pretty good. 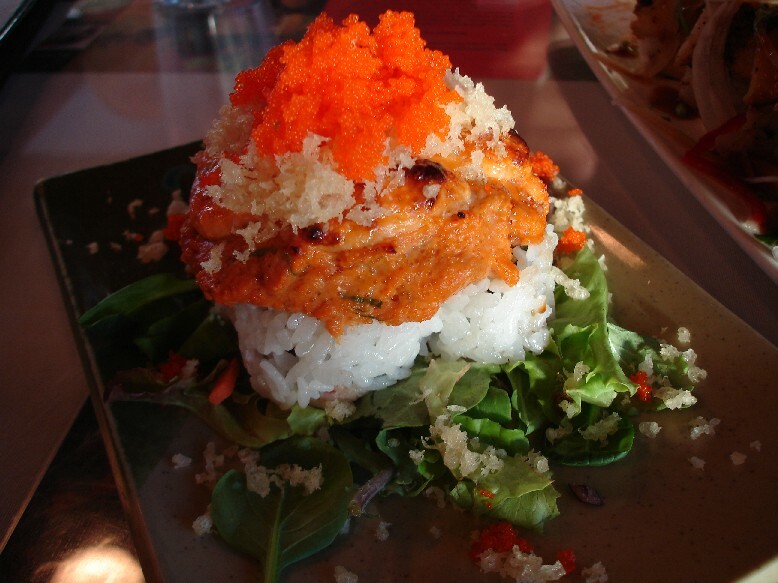 We also enjoyed the Spicy Tuna Dynamite ($9.00), a california roll topped with spicy tuna, creamy dynamite sauce, tempura chips and masago. 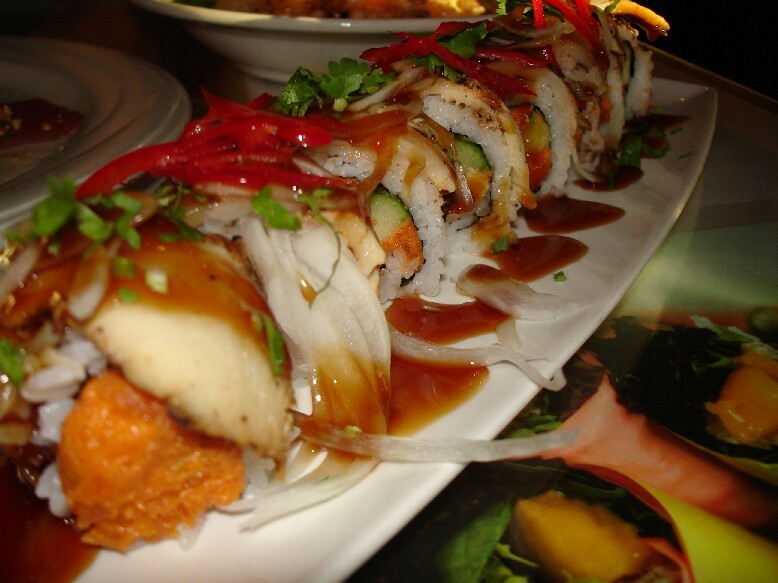 Everything is on the sweet side and smothered with a million kinds of sauces, but overall Sansei is a fun place to eat! If anything, it’s at least entertaining to me to see what crazy flavor combinations they come up with to inject into sushi. MENU: $6.95-$14.95 for sushi rolls. View their menu here. RETURNING? : Probably not on my own. Except Sundays and Mondays before 6:00pm, when all food is 50% off! Met up with a friend for lunch at Sushi King. We’re both Japanese and this is not our top choice for the most exquisite Japanese food, but we chose it for their good selection and laid-back atmosphere. Plus I like the little touches here that really make a difference for me. One of them is that they serve a shiso leaf as a garnish for the sashimi which to me is the finest herb accompaniment to a slice of ahi. Also they serve tonjiru (miso soup with assorted veggies and pork) instead of regular miso soup. Another is that their yakitori is actually what it’s supposed to be: chicken grilled on skewers, instead of some other restaurants that think yakitori just means teriyaki chicken. Not the same. 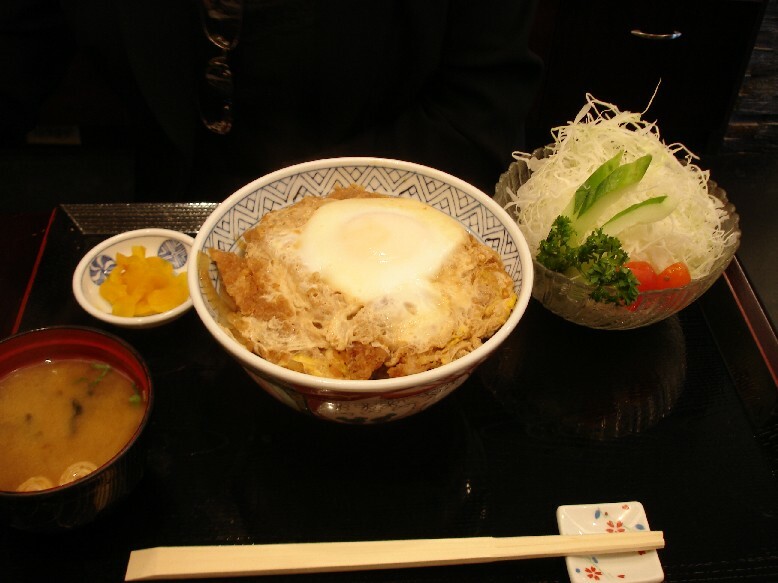 We both went with the lunch combination teishoku ($13.95) where you can select two entrees from an impressive list. My favorites from the list are the sashimi, fried oysters and yakitori, but today I went with a mini tempura udon and fried oysters. As you can see, the portions are pretty generous. My friend chose chicken karaage and sashimi. Besides their lunch specials, they’re also popular for their early bird and late night specials for dinner. I usually include a copy of the menu in my restaurant reviews, but unfortunately they didn’t have takeout menus available since they’re in the process of updating prices (uh-oh!?). Hopefully next time. 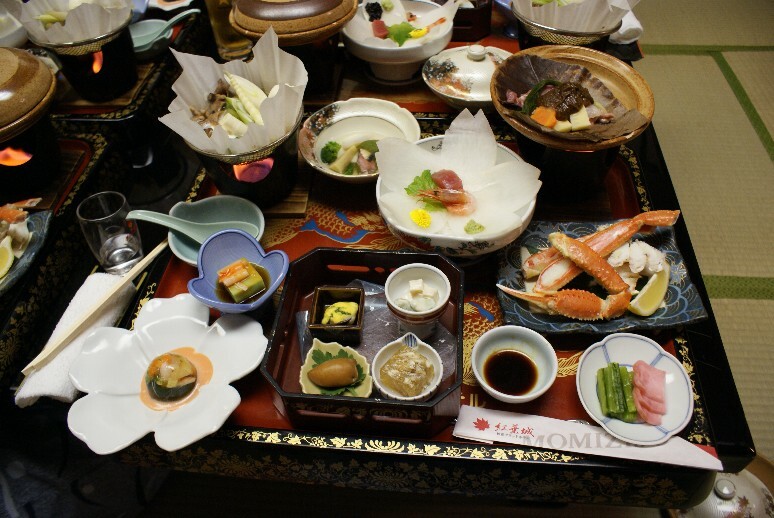 I’ll end my posts on Japan with a shot of our dinner at the Akiu Grand Hotel, a traditional onsen ryokan (hot springs inn) located in famous Akiu Onsen, about 1 hour by car from Sendai. 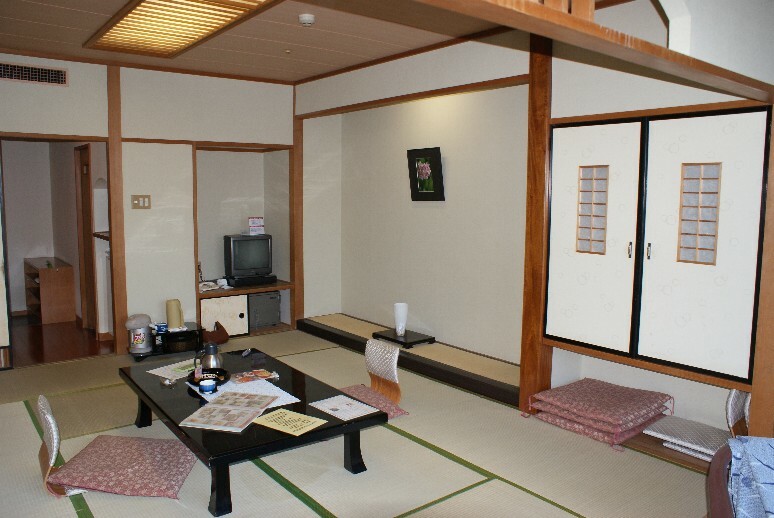 We treated ourselves to a relaxing overnight stay of good food and hot onsen. 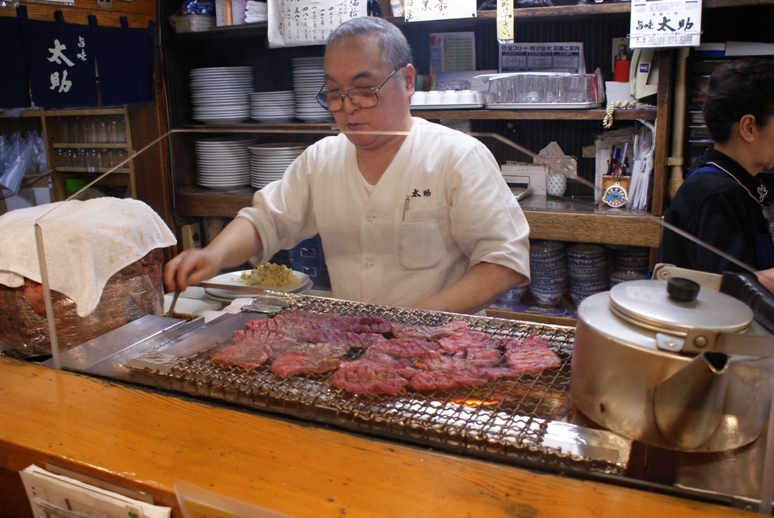 Sendai, Japan is nationally famous for its gyu-tan (cow tongue). 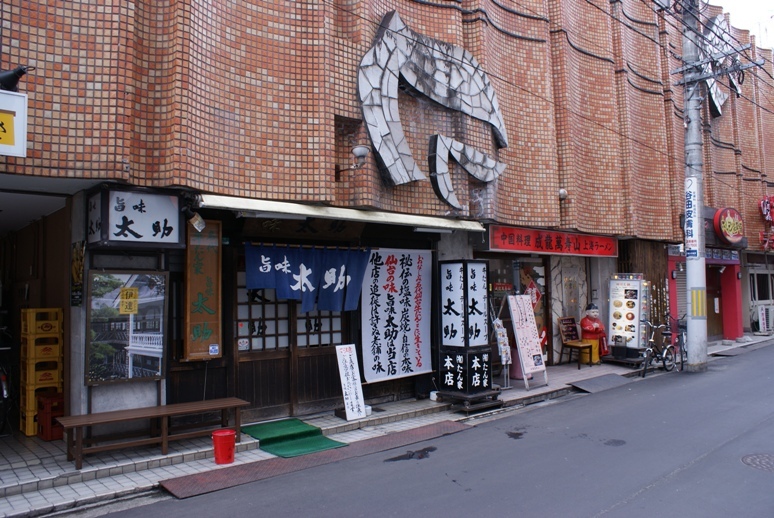 We visited the famous Tasuke restaurant for some delicious grilled gyu-tan. According to my dad, the history of gyu-tan in Sendai dates back to post World War II Japan, a time of heavy US military presence in the area. The average Japanese did not consume much beef back then, but the US military had beef shipped over for their consumption and then they would throw away the parts of the cow they did not eat: the tongue and the tail. The founder of the Tasuke restaurant approached the Americans and negotiated the purchase of beef tongue and tail from them at cheap prices. 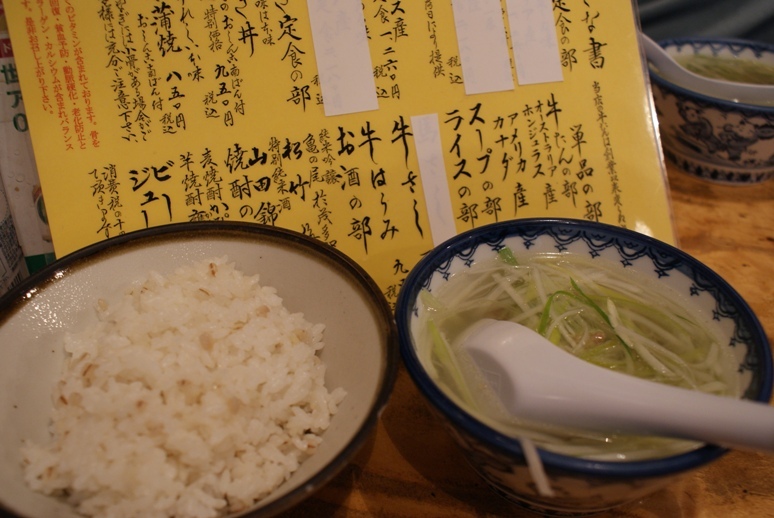 He began selling meals of grilled tongue, tail soup, and barley rice (because back then barley was cheaper than rice) which became wildly popular, and the rest is history. We visited the legendary original Tasuke restaurant located in Ichibancho, the heart of Sendai’s shopping/dining/entertainment district. It’s always super crowded, but the service is quick. Everyone pretty much only orders one thing on the menu: the same gyu-tan teishoku (1260 Yen) that’s been on the menu from the start. Barley rice (a mixture of white rice and barley) and flavorful tail soup with fresh negi (green onion) strips. I like to sprinkle a lot of pepper into my soup. 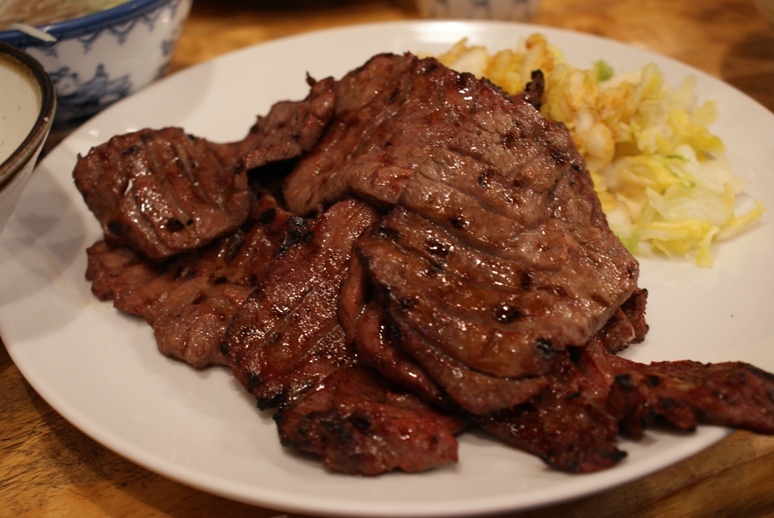 … And grilled gyu-tan with tsukemono. For those of you who have not had tongue before, it’s delicious. It’s perhaps one of the most flavorful parts of the cow and has a nice chewy texture. 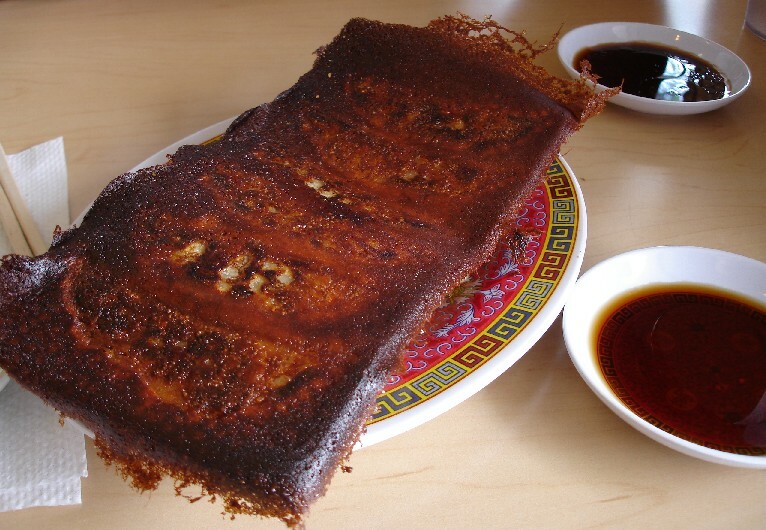 With a little sprinkle of shichimi togarashi (chili pepper powder mix), it’s absolutely heavenly. This is a favorite stop for both hubby and I when visiting Sendai. I’m always reminded of a striking fact when I come home to Japan. And it’s that the vegetables and fruits have so much more flavor here. 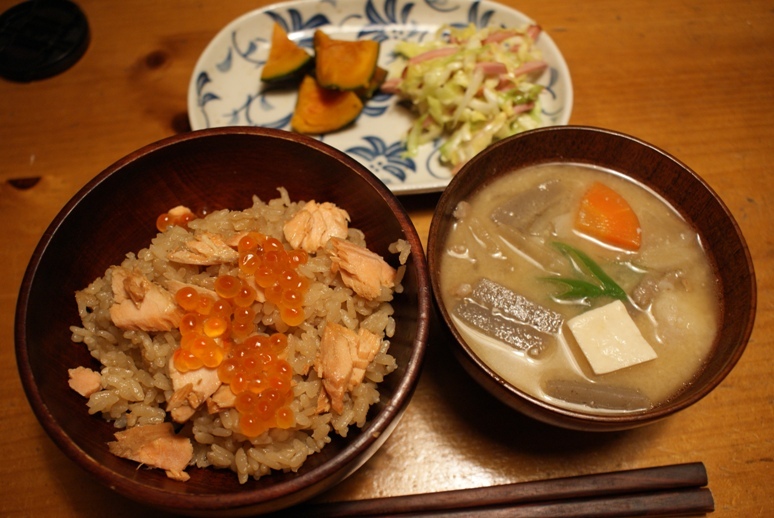 When I bit into the carrot in my tonjiru, I was struck by the sweetness and earthy flavor. And only then do I realize what I’m missing. Perhaps I need to start looking for and investing in some better quality produce back in Honolulu.